Sitting at the foot of The Remarkables on the shore of Lake Wakatipu, Queenstown Airport is home to the Wakatipu Aero Club. Rob Neil visited the club recently for some refresher training in the club’s speciality: mountain flying. Pacific Wings was privileged to participate recently in a tour of major Asian factories supplying components for Boeing’s Dreamliner programme. Rob Neil reports. Peter Cooper has never missed a Royal International Air Tatto (RIAT). At the 2010 event, he says Lockheed’s F-22 Raptor was the unquestioned star of an outstanding show. 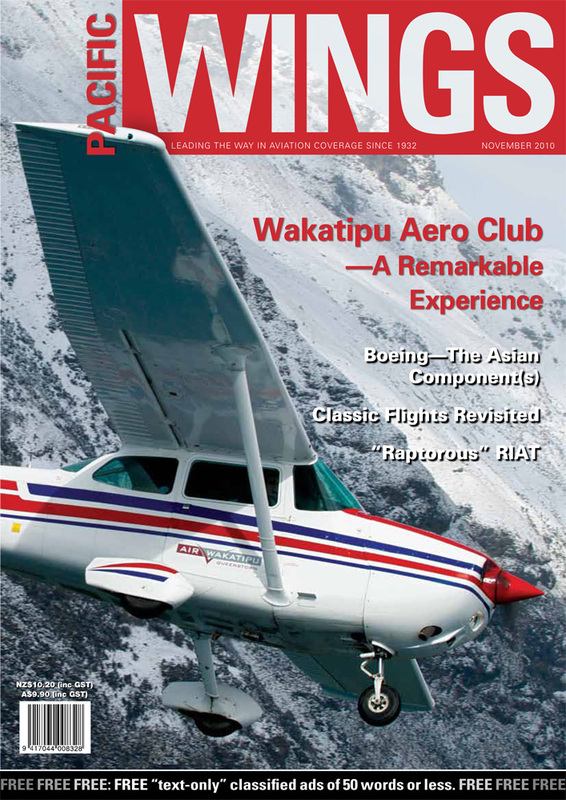 Pacific Wings last visited Peter Hendriks at Classic Flights, Wanaka in March 2008. We revisited Peter recently to find out what has changed and how Classic Flights has weathered the economic storm of the past two years. Don Harward shares a few of the lessons he has learned during his (still-active) flying career—many of which he still has to apply every day.